Normally you'd do everything you can to rid your home of moths, lest they leave your clothes and other fabrics riddled with holes. But this over-sized facsimile is actually being sold as a stylish alternative to run-of-the-mill smoke detectors that you won't mind having perched to your ceilings. Designed by Paola Suhonen, the $37 Lento is a photoelectric smoke alarm that comes in a small selection of colors to match or complement a room's decor. It adheres to walls or ceilings using removable 3M tape so installation is easy, and the moth's entire body serves as one large button for silencing false alarms or performing tests. 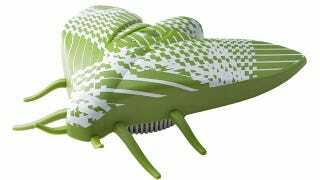 A single battery keeps it running for five years, so all you have to worry about is coming to grips with these 'stylish' plastic bugs stuck all over your home.